On the third Saturday of May, in 1980. a thirty-year-old scientist named David Johnston headed up the gorgeous Toutle River Valley in Washington State, one of the prettiest places on God’s green earth. 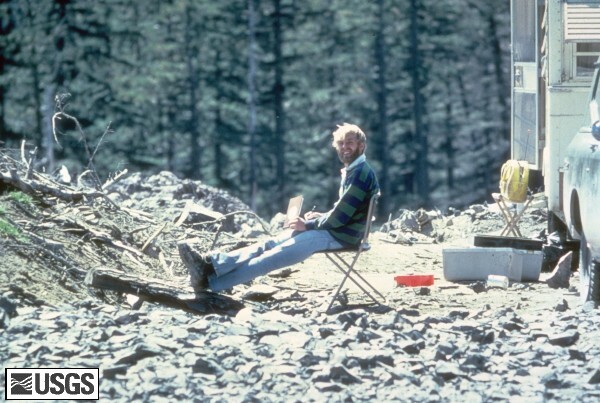 Johnston, who worked for the United States Geological Survey, had agreed to fill in that weekend for a colleague, manning an observation camp on Coldwater Ridge in the Cascade Mountains. After “making the rounds” that day, Johnston settled into his “home” for the next 24 hours – a small, well-worn camper parked on top of a mess of rocks, surrounded by piles of broken tree branches. Not a luxurious setting by any means…unless you factored in the location. Spread out at Johnston’s feet was the kind of view that eats million-dollar views for breakfast. As far as the eye could see (and that happened to be mile after mile, from here), there was not a single man-made object. Below his feet, the ground dropped away into a wide valley that was ringed by towering, snow-capped peaks. Everything sparkled in the sun like jewels: the silvery river threading its way down the center of the valley; the deep emerald-colored evergreens blanketing every square inch of flowing mountainside; the nearly sapphire-blue sky. Although Coldwater Ridge was at an elevation of more than 3000 feet, and it was only the middle of May, the day was postcard-pretty – so warm that Johnston was dressed in his shirtsleeves and a pair of jeans. The setting may have been gorgeous, but it wasn’t perfectly serene. For looming over everything, directly in front of Johnston and just 5 1/2 miles across the valley from his camper, was the Behemoth – the mountain that had drawn the USGS scientists to this spot with her recent rumblings and groanings. The mountain sported ominous new bulges on her snowy sides and had been blowing steam and ash into the air for weeks – until two days ago, when she’d gone deathly silent. In previous centuries, the Indians had called her Louwala-Clough, or “smoking mountain.” Her modern, less-lyrical name: Mt. St. Helens. Johnston watched the sun paint pinkish streaks on her western side as shadows crept up her eastern flanks. He watched her at rest, massive and solid and as immovable as Time Eternal. He watched and listened, and heard nothing. Shortly after 8:00 the next morning, a mile underneath Mt. St. Helens, the huge rock plates that make up the earth’s crust shifted. A magnitude 5.1 earthquake ripped through the ground, triggering a massive increase in steam and pressure inside the mountain. As the northwest peak of the mountain collapsed, 24 megatons of thermal energy were released – 50 times more than that of the atomic bomb over Hiroshima. Those five words would be his last. His remains were never recovered. 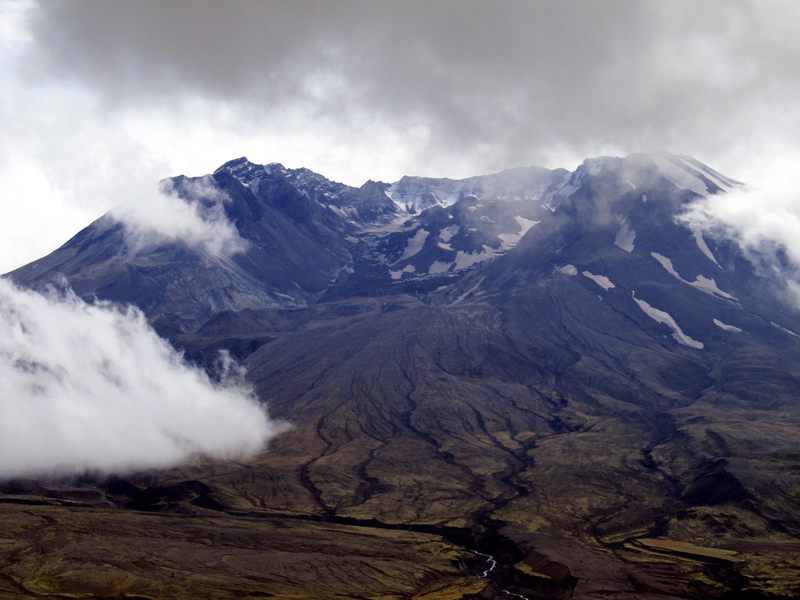 The eruption caused the largest avalanche in recorded earth history and removed 1300 feet from the mountain’s summit. The pyroclastic flow, traveling at several hundred miles an hour (and combined with the lateral blast) leveled 230 square miles of forest, killing 57 people and millions of wildlife. The ash billowing from the mountain rose more than 80,000 feet into the air, closing down air traffic in the northern United States. Day turned to night in Eastern Washington. Ash fell on the ground as far away as Minnesota and Oklahoma, and over the next 15 days, drifting in the atmosphere, it circled the earth. I was 9 years old that Spring, and I remember ash falling like snow onto the streets where we lived, just outside of Salem, Oregon, 100 miles south of the eruption. Of the 1500 active volcanoes in the world, about 40 of them sit in the contiguous United States – most of them in the Pacific Northwest – and before 1980, none of them had proved deadly. Prior to March of 1980, Mt. St Helens had lain dormant for 123 years. That May 18th, she made history. Although my husband and I have lived in Oregon for a combined total of 61 years (and I really wish I had not just done the math on that), we had never visited Mt. St. Helens. You can see her from almost everywhere in Oregon, on the northern horizon, snowy and distinctive with her flattened top – but big, beautiful, snow-capped mountains are a dime a dozen in these parts. In the decades since her eruption, we hadn’t paid her much mind. When Mt. St. Helens started acting up again in 2004, our whole region went on high alert. In 2005, when she started spewing out ash and steam, I used to stand outside my office building and watch the smoky plume from across the Columbia River. We thought she might blow again – but after making some noise off and on for the next three years, Mt. St. Helens once more went dormant. Dan and I thought about visiting her, someday, “when the boys got older,” but after a friend took her small children up there a couple of weeks ago, and came back raving about how pretty it was, we decided to make the trip last Saturday. By the time we’d gotten a few miles up the Toutle River Valley, I was thunderstruck. Even though it was overcast, and visibility was only a few miles, the scenery was as pretty as any I’ve ever seen – and I’ve been to the European Alps. After driving some 50 miles off the interstate, we reached the Johnston Ridge Observatory, a multi-million dollar tourist exhibit that sits on the same ridge where its namesake lost his life. When we got out of our van, the air temperature was 44 degrees and a strong wind was blowing. 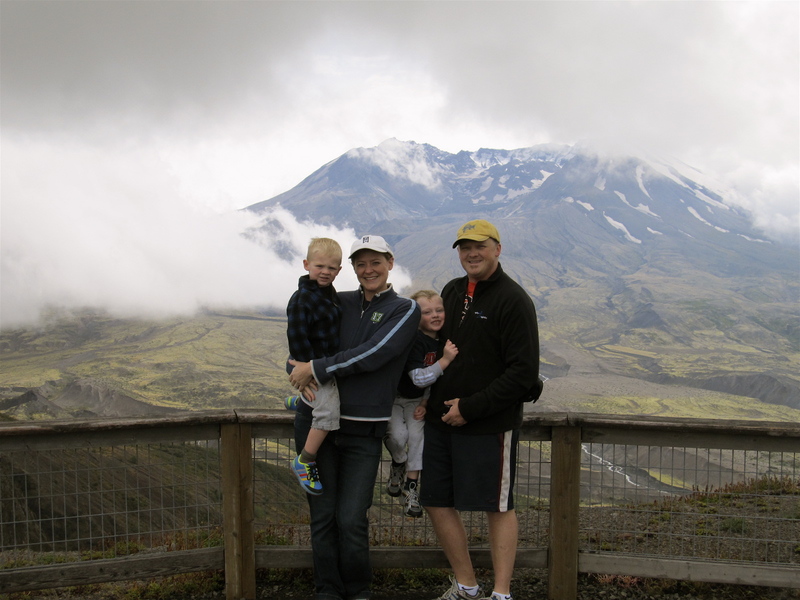 We hurried the boys to the front of the building, which overlooks the valley, but there were so many clouds out, we couldn’t exactly tell where the volcano was. We went inside and looked at some interesting, interactive exhibits, and then went into a movie theater to watch a short documentary. The movie turned out to be short on eruption info (which is what I was interested in), and long on land-rejuvenation info – but once it was over, the screen rose, the curtains behind the screen parted, and we were looking through an enormous wall of windows. The clouds had parted by now. And there, just five miles in front of us, was Mt. St. Helens. She’s magnificent, people. Unbelievably gorgeous, even with her ripped open flank…maybe because of her ripped open flank, which allows you to see right inside her belly, to the new dome that has been slowly pushing up from her depths. The whole Valley, miles and miles of forested slopes and yellowed plains, seems designed just to frame her, in a spectacular tableau. While we were there, clouds hung like smoke around her snow-streaked cavities, making it almost seem like she was breathing. Of course, when this creature exhales, the whole world knows it, and when you’re next to her, it’s impossible to forget what she’s capable of. Still, I fell in love with her, a little. After we’d wandered around the area, snapping photos with the boys (and scouting out a trail we want to hike when they’re older), we drove back down the mountain. We stopped at another tourist center, where you can look through giant telescopes at the valley below, where there is supposed to be a herd of elk (although we couldn’t see any.) We went on a mile-long, secluded hike through the woods, during which I managed to stifle my nervousness about the potential presence of bears and mountain lions. Our littlest pooped out before we’d finished, and rode on his Daddy’s shoulders the rest of the way. It was a marvelous day. We stopped for dinner a few miles further down the road, at a converted house overlooking the river, where we were served by friendly mountain folk. We ate seafood and chicken and fries and homemade cobbler with ice cream, and our boys practically licked their plates clean while their Dad and I drank coffee. It wasn’t until we were back on the interstate, with my littlest fast asleep in the back seat, that I realized: I hadn’t thought about anything all day, except for the things my little family was doing. I hadn’t thought about reading, or writing, or people, or news, or world events, or all the undone tasks at home. It’s as though that majestic landscape was so overwhelming, so full of authority, it’d demanded my full presence and attention. For my particular brain, thinking of nothing, just being present in the moment, is a near miracle. Do I need to tell you, we’ll be going back? Note: the photo of David A. Johnston at the top of this post was taken around 7:00pm on May 17, 1980, at the spot where he would die less than 14 hours later. For complete information on Mt. 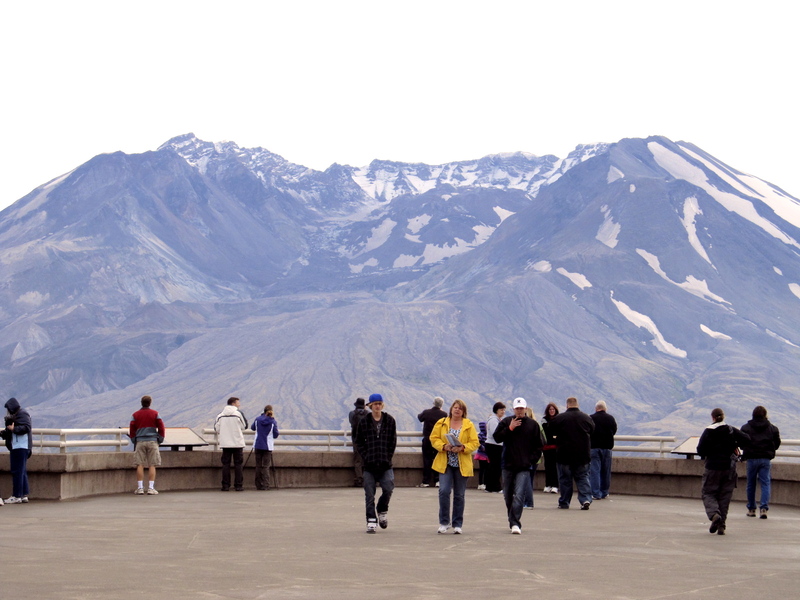 St. Helens, including a far more detailed description of the eruption, visit the Mt. St. Helens website. And Westerners – I’d love it if you’d share some of your personal Mt. St. Helens memories below! Very nice. Similarly, I remember watching the eruption plume from my cousin’s roof in Portland, everything in Gresham covered with ash. I’ve been there once, when I was 13-14 to plant seedlings with my scout troop…it wasn’t very pretty back then, lol. Now I have to go back. I love that all along the highway up the mountain, there are placards stating when the different areas of trees were re-planted. It’d be neat to find yours…they’re really tall, by now! I was in the 1st grade, in transit from MT to AZ (moving with family) the day it blew. I didn’t get to see the ash or any of the spectacle, but I remember vaguely something about a volcano blowing. I visited her majesty the first time a few years ago and you’re absolutely right about how her splendor completely captivates. I’ve never witnessed such awesome grandeur. It is incredible. I’m feeling inspired to go again. 😉 Maybe I’ll go this Saturday…before the weather changes. It really is something, isn’t it? Almost indescribable…you have to see it in person. Check the website though…they MIGHT be closed until Spring. I thought they were open through September, but I think the observatory is closed for winter. We just made it in time! What a fantastic essay, Cathy! Great job with this. I’m expecting you to take me here when I come visit. My sister just moved to Whidbey Island (her husband is in the military) so we’ll be up that way sooner than later! Tony. This is important. You MUST see this, and I MUST go with you, which means you MUST wait until next year to come! The roads are closed for the winter, until May 15. I honestly now feel like this is the one “don’t miss” spot in the Northwest, for visitors…it’s not to be believed. I will take you and the fetching Miss K.
I have always found this story fascinating, and you handled it as well as anyone. Great stuff. Thanks, D. Means a lot, coming from you. This is my absolute favorite kind of thing to write. I did a LOT of research…and that’s more fun to me than anything on earth. It’s like going to Disneyland. This day is forever etched in my mind….it scared the beejeevies out of me! I was in 6th grade, living in Spokane, WA and our Sunday school teacher had taken all us girls out to her lake cabin. We were paddling in the canoe when suddenly the sky started turning dark, and this flakey stuff was falling from the sky. It obviously was NOT snow! Us kids were too young to have paid much attention to what was happening with Mt. St. Helens, and this was before cell phones and internet. As an adult I can imagine the responsibility to get all us girls home, and not knowing for sure what was going on. It wasn’t till we reached the highway and had radio signal that we knew the Mt. had erupted, and of course they were telling everyone to stay off the roads. With windshield wipers going, and puffs of ash flowing behind us we crawled back to the church where our parents were all anxiously waiting for us. No School for a week!! We had to wear face masks if you went outside. And my Dad had to go on the roof to shovel off the ash, as peoples roofs were collapsing due to the weight. For years you could run across piles of ash. My Dad has some gemstones that are made from the ash, they are a beautiful blue-green color, very vibrant. I think they are called Mt. St. Helen’s stones. We camped up at Seaquest a few years ago, and it was still a little eery to me to be so close….knowing first hand the power this Mt. has! I love this, Wendy! So descriptive. You were almost at ground zero…other than the Toutle River Valley, Eastern Washington got the worst of things! My family didn’t even have television, so I guess we got our news from the radio. It was certainly a different world! I feel fortunate that now we are able to monitor events in real time, when something cataclysmic happens. I want to see those gemstones. google Mt. St. Helens gemstones….they are gorgeous! I didn’t realize they actually come in various colors, but the ones my Dad has are the vibrant green I believe! Very nice essay, Cathy. You’ve mastered the art of using just the right amount of descriptive words to paint a beautiful picture. Mt. St. Helens has always played a part in my family’s history. My grandma, born in 1906, grew up in its shadow. She was heartbroken when its ice cream cone top was blown off to be replaced by the flattened shell. My daughter was just turning 2 when the mountain blew. She was one of the only 2 year olds I’ve known to play imaginary ash shoveling games. We visited just a couple years later and all swam in one of the lakes that has since been put off limits. The terrible sight of all the downed trees laying parallel on the ash covered ground like a giant’s match stick factory left us all speechless. Then, right in that lake we saw life returning. Bugs, salamanders and small fish shared the water with us, along with ferns and other plants growing up out of the ash. Only time can reveal what the Creator has in mind in re-creating a landscape or a soul. I think part of what is so powerful about being up there, is how much beauty there is after so much devastation. I was in LA at college, and the eruption was news but not all that close to home for me. My wife, Valerie, on the other hand, had family up here and it was a bigger deal for them. 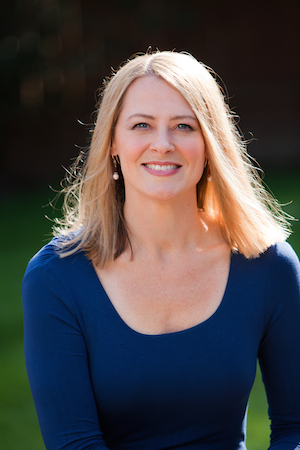 Her grandfather was a lumber jack and was forced to retire because his lungs couldn’t handle working with all the ash that was still in the air (like Wendy mentioned, the ash was around for a long time….) One of Valerie’s prized keepsakes is a little vase with a rose painted on it that was made from the ash. Valerie and her folks had camped the summer before at the Toutle River campground that was completely wiped out, and when they visited a year after the blast, the devastation was incredible — rows of huge trees lined up like toothpicks spread on a table, and nothing growing around them. The first time I came up, we were still living in LA (1993) but visited the local relatives (in Morton, a small town lumber town not too far north of the mountain) and the devastation was still pretty wide spread — there were still rows of trees laying flat pointing away from the mountain, but there was growth around them. Now, when we drive up, you don’t see those downed logs because they are covered with the growth of the rebirthed forest. There are so many pictures of the devastation, at the tourist centers (and on-line, of course)…which makes it all the more stunning to see the beautiful re-growth. The week before we went, I got a little nervous about going (I was, naturally, doing all sorts of volcano research), but once we were up there, I didn’t feel afraid at all…even though there is a certain sense of, if not quite danger, I guess “suspension,” up there. I know you mean about the sense of not-so-imminent danger…. It feels like a dangerous spot, even though there’s nothing happening now…. I was 15 and had just moved to the pacific NW and probably had never heard of Mt. St. Helens. A little bit of an unnerving welcome…. I can imagine! I’m surprised you guys didn’t turn around and head right back! ha….well, we were actually in Vancouver, BC when the mountain blew (& that’s a very long sorted story that has nothing to do with your blog), but if we had left, I wouldn’t know you. Aren’t you lucky!? Amazing Cathy….thank you for sharing. Cathy, I love what you wrote – beautiful!!! It made me feel like I was sitting back up there at the lookout. I was only 3 at the time of the eruption, but May 18th is my dad’s birthday and I do remember vaguely how dark it was on his birthday, brushing ash off our windshield, and a news clip where cars were on the road in eastern WA., and it was dark outside in the middle of the day with ash snowing down like a blizzard. I totally agree. Several times, while I was writing the post, I thought “Don’t over-sell it”…but it’s hard to hold back. You really can’t understand until you see it all, how amazing it is. THANK YOU for giving us the idea to go!